JULABO Open Heating Bath Circulators or Heating Circulators with high quality stainless steel, Plexiglass or Makrolon bath tanks are mainly used for internal and external temperature tasks. Temperature application to external closed systems is possible via the pump nozzles. Models with different bath sizes and operating facilities are available. 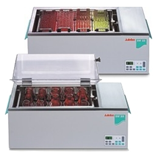 Accessories for these units include test tube racks, bath covers etc. An integrated cooling coil is provided for temperature applications at near ambient or just below. 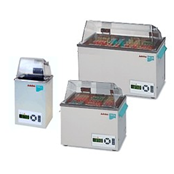 The TW series offers high-quality water baths with MICROPROCESSOR technology and a temperature stability of ±0.2 °C. The working temperature range offers many application possibilities, e.g. routine laboratory applications, temperature control of samples, incubations, dental applications, material testing, corrosion tests, tempering of cultures as well as temperature testing of food and luxury articles. The units are provided with overall splash-water protection and have a keypad for temperature settings and with temperature indication (LED) for easy operation. Dry-running protection as well as optical and acoustical warnings, and switch-off functions, offer maximum protection for sensitive goods which require to be temperature controlled. There are a wide range of accessories including test tube racks and lift-up Makrolon covers available. JULABO shaking water baths with seamless, splash-water protected keypad offer a high operating comfort. The bright MULTI-DISPLAY (LED) indicating up to 6 temperature values is visible from across the lab. Advanced MICROPROCESSOR technology with PID temperature control eliminates temperature overshoot and provides high temperature stability. The built-in timer simplifies time-dependent applications. The RS232 interface allows on-line communication with PC. Sensitive samples in the bath are well protected: As soon as the high and low temperature limits are reached an interval tone sounds. If the liquid in the bath reaches a minimum, a complete shut-down is effected and a permanent signal tone sounds. Instruments are conceived for unsupervised continuous operation. Bath tanks and all parts in contact with the bath liquid are made of high-grade stainless steel.